We all run for different reasons. I train for and participate in racing events to be social, maintain a healthy lifestyle, and assuage my guilt on the rare occasion of consuming more ice cream than any man should be able. Others simply run for the medals (aka bling). My opinion is that a medal is a nice reward and memento for a great race. I also have come to realize that a great medal is a sign of a well executed event and a race director that pays attention to every detail. With the fall distance racing season upon us, it's time to look at what we're running toward during coming events. Share in the comments below which is your favorite! It's too late for you to earn this race schwag, as it was handed out this past Sunday, October 19th in Mandeville. The super functional bottle opener in the center was the reward for completing the 10 miler or half marathon. The Back2Back Challenge medal was for completing one of those longer distances after finishing the Keeping Up With Jones 5K the day before. In addition, to celebrate the fifth anniversary of the half marathon, 5-year finishers received the extra big bling at a post-race awards ceremony. Touted as the "most dangerous running medal in the world," this sugar cane thrasher is awarded to participants who tackle the 4-mile race plus the two 1-mile races at the Cane Field Classic event. The feat is entitled the Cane Cutter Challenge, and still abides by your mother's rule to not run with sharp objects. Instead, you'll be running FOR sharp objects. 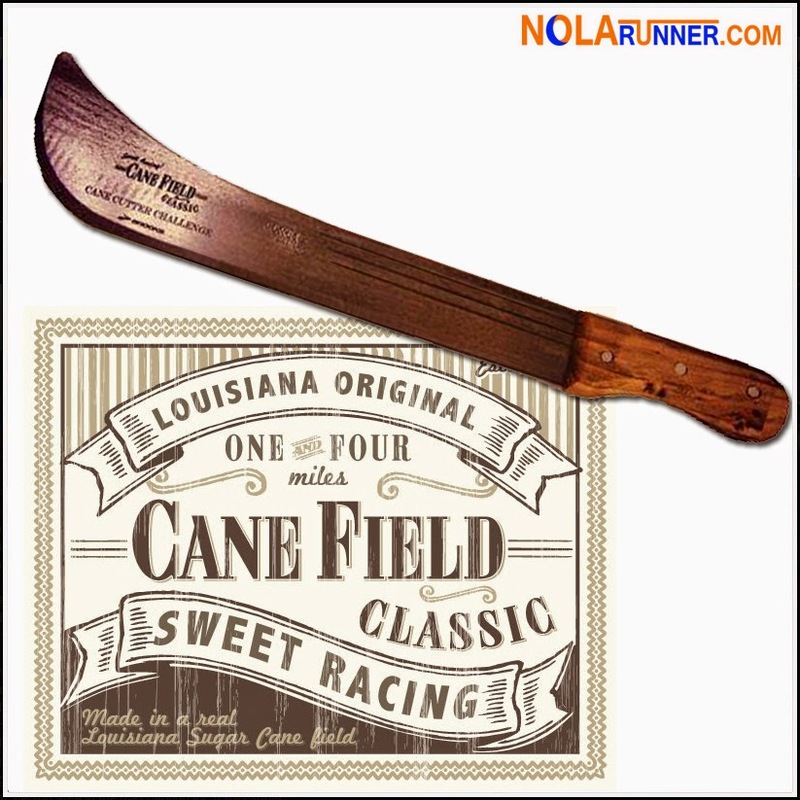 Get more details on the Cane Field Classic HERE. 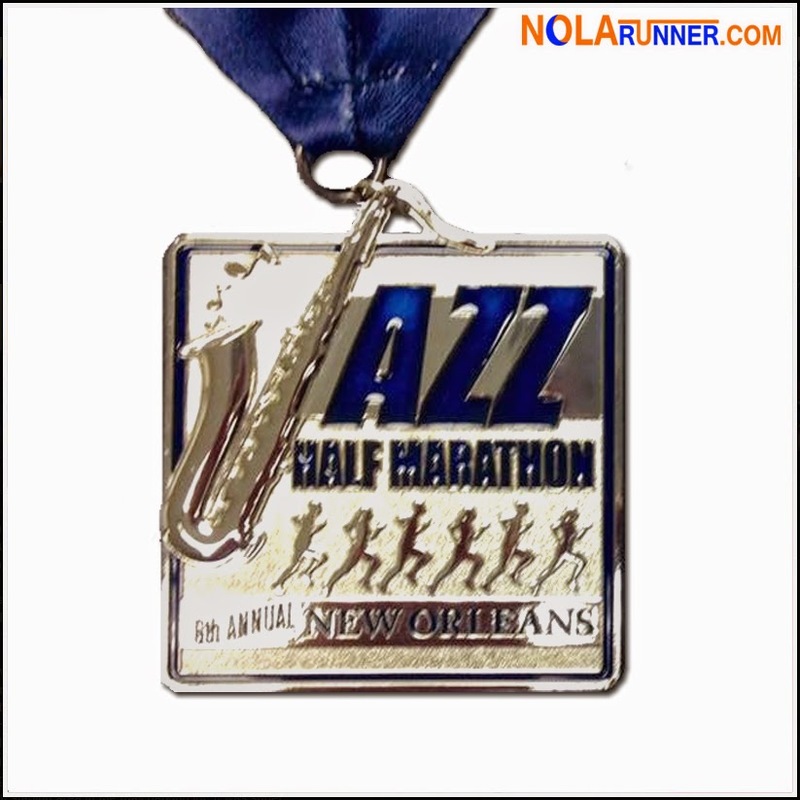 After a brief 5th Anniversary departure from the traditional logo-inspired medal, the Jazz Half Marathon returns to a simple but classy design for this year's race. Adding some extra sparkle is a high gloss silver finish that makes for tough photography. All finishers in the half marathon receive a medal, while the first 500 finishers of the 5K receive a similar, yet smaller version. All proceeds from this Downtown / Uptown NOLA event go to Children's Hospital. Don't let the name and all the pink fool you, the Woman's Half Marathon is guy-friendly. 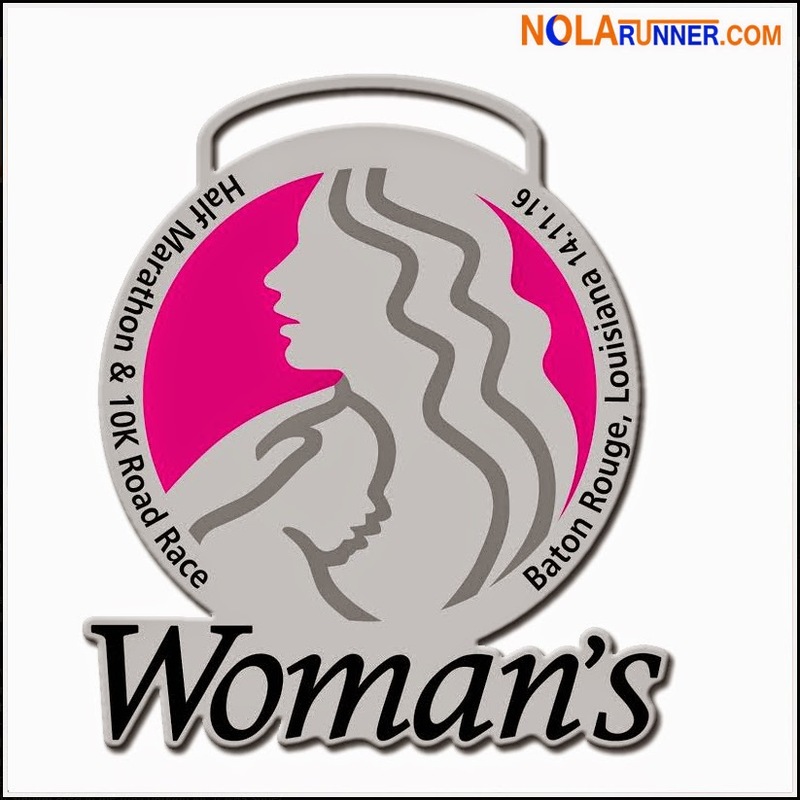 Benefiting the Baton Rouge hospital specializing in female and infant medical needs, The participant shirts do come in female sizes as well as unisex, Plus, finishers in the half and 10K each receive this unique high polish silver medal accented with a translucent magenta fill and a chevron print ribbon. Since this is the first place the medal is being shown, you're also the first to know about the code BLING to get 20% off registration! 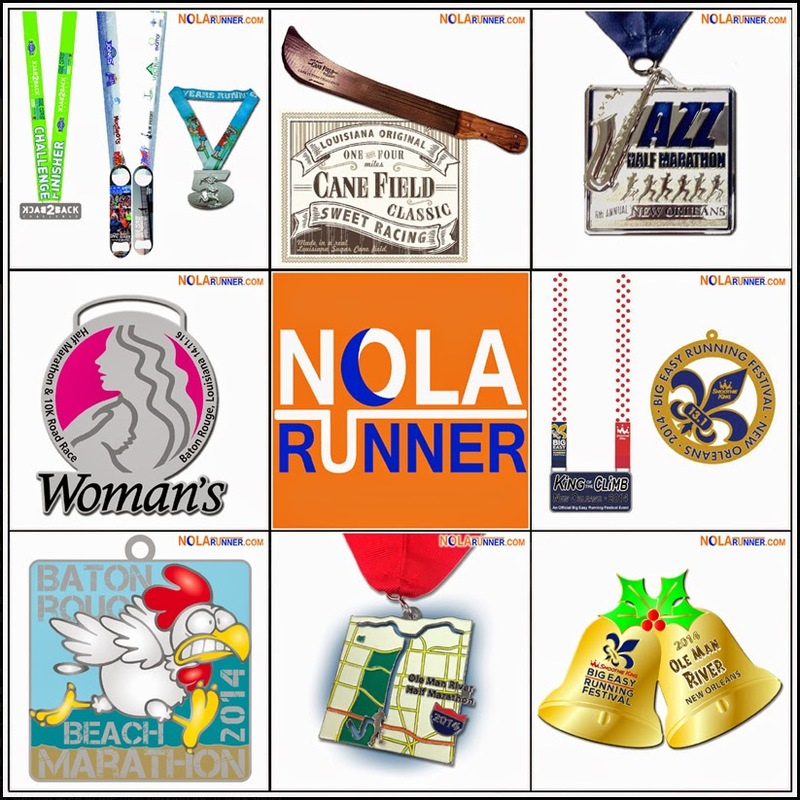 The Big Easy Running Festival gives runners several chances to earn bling. The half marathon distance starts on the Westbank of New Orleans, traveling over the Crescent City Connection bridge before finishing in downtown NOLA. The King of the Climb competition is for the athlete that climbs from the base of the bridge to the top of the span in the fastest time. The polka dot ribbon on these top climbers' awards is reminiscent of the climber's jersey at the Tour de France. 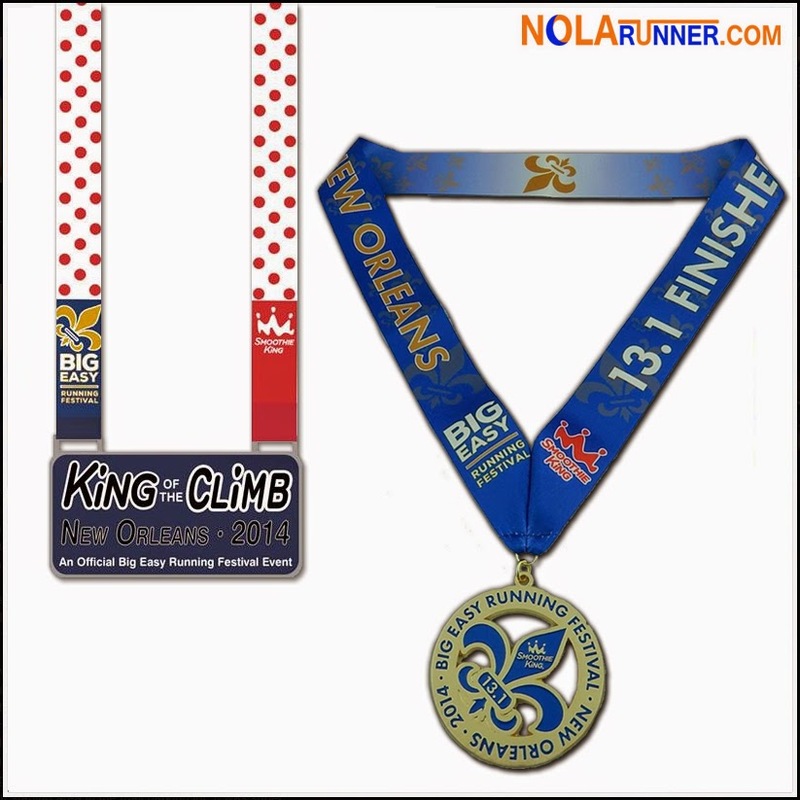 All half marathon finishers receive a fleur de lis medal that's guaranteed to be heavy! 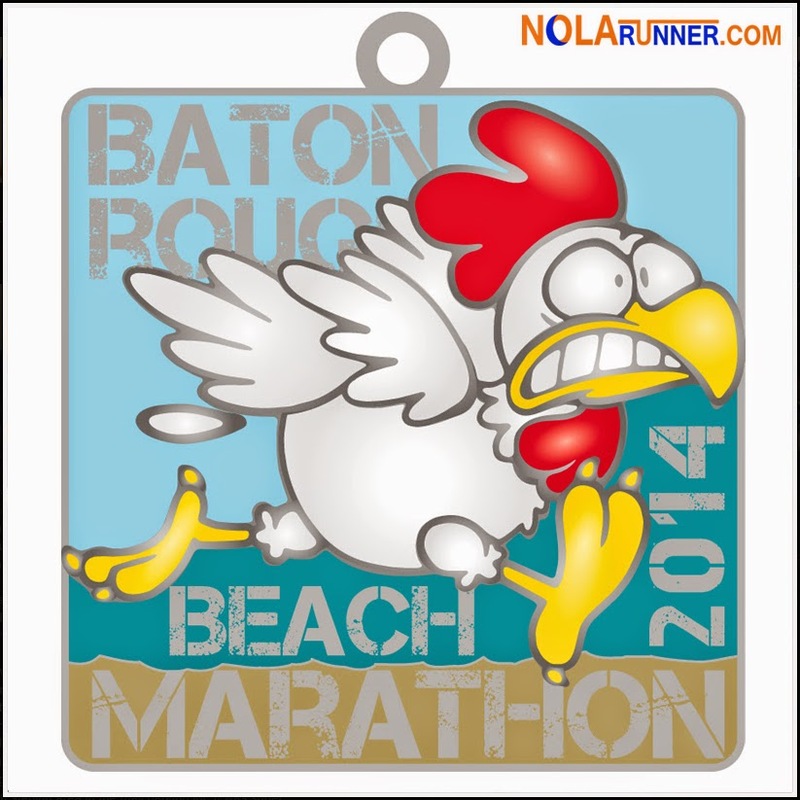 Finally turning legal in 2014, the Baton Rouge Beach Marathon & Half Marathon celebrates its 21st running on the first Saturday in December. The fowl on this year's medal is part of the recent re-design of the race's founding organization's mascot, The Running Chicken Track Club. Pictured here is the full marathon medal design. 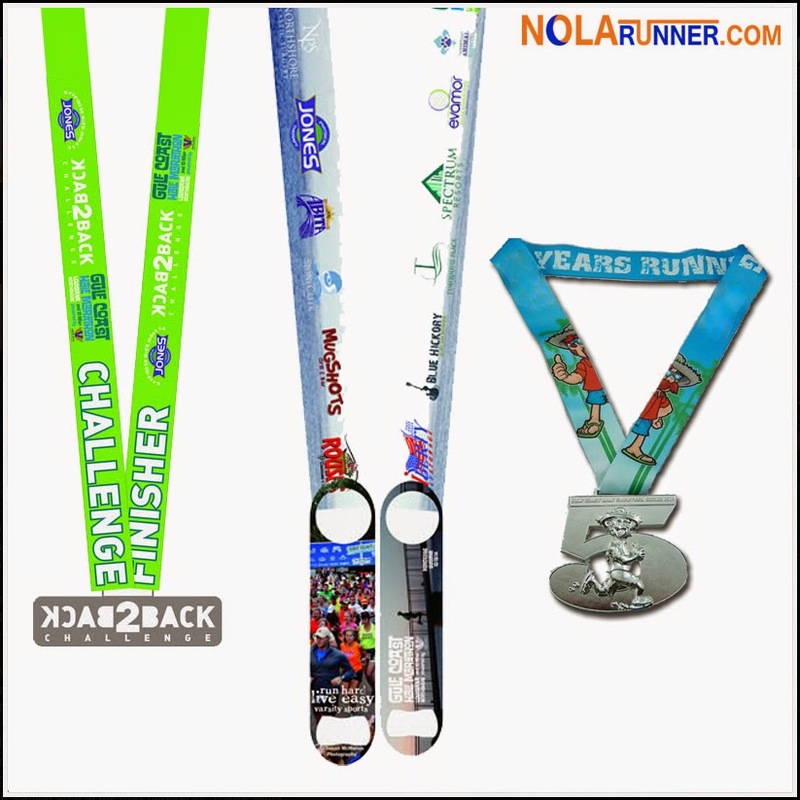 Traditionally the half marathon design is the same; however, features adjusted wording and a different color ribbon. 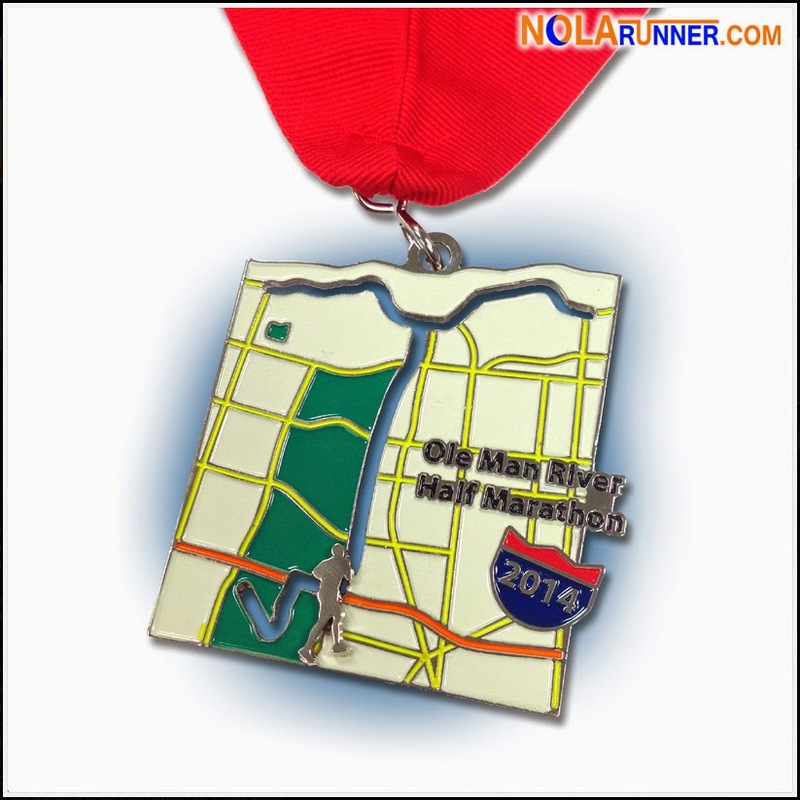 Even though the Ole Man River Half Marathon will be the oldest half in New Orleans with its 33rd running, it's taking a step forward in medal designs with a cool motion element. The mini-runner on the medal moves through a cutout on the design which is a map of the course. He (or she) travels along Bayou St. John, up and down the lakefront, and back to the finish in City Park. 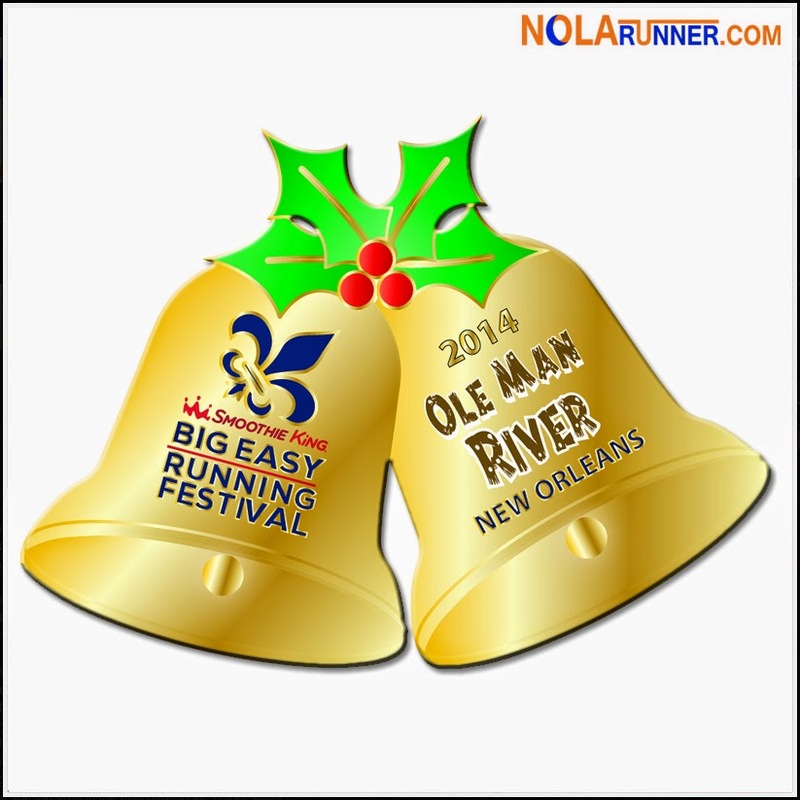 For a shot at some extra bling, the Big Easy Running Festival and the New Orleans Track Club have teamed up to offer runners of both the Big Easy Half and the Ole Man River Half a special challenge. Run these two races and receive the Holiday Half Challenge medal seen here! It'll even be designed so that it can be removed from the ribbon to hang from your holiday tree! For more info on the Holiday Half Challenge, click HERE.